Easter is our holiday. Normally, we are divided between families for almost every other occasion (Christmas here, Thanksgiving there), but everyone comes to us to celebrate Easter. It’s a great thing that we look forward to every year. Last year, due to the smallness of our apartment and the chaos of the new house and dealing with Christopher’s knee being as it was, we weren’t able to host Easter, and we missed it. And that is why we insisted on Easter with us again this year. 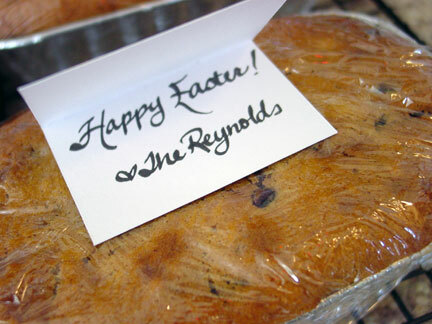 In our new home that needs holiday memories, especially the important holidays – like Easter. We cooked a load of food (Chris smoked brisket in the smoker he got for Christmas; we skewered way too many shrimp and veggie kabobs for the grills; we made a big bowl of potato salad; and I made fresh strawberry ice cream and chocolate chip banana bread for dessert). We’re still eating the leftovers. 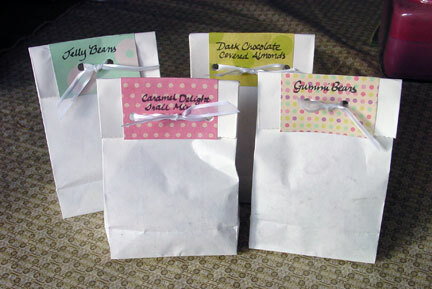 I found really cheap treat bags at the craft store and a small pad of matting paper on clearance, and put them together to make these really neat and colorful little bags. 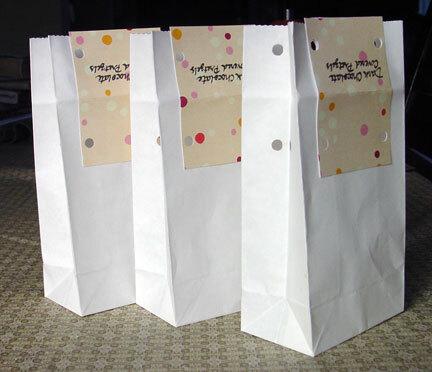 And then I bought a lot of stuff from the bulk food section at Sprouts (gummi bears, chocolate-covered pretzels and almonds, some trail mix, and jelly beans) and filled the bags with those things. I pulled the tops shut by punching two sets of holes and stringing ribbon through for a simple tied finish. 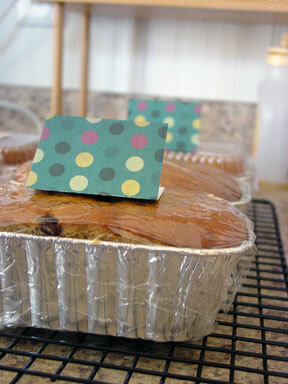 Then I baked a double batch of the chocolate chip banana bread I posted about a few weeks ago (“Weekend Workroom: Parts of the ‘Buffalo’“), using small disposable tins rather than my bigger loaf pans (though I used the leftover batter for a bigger loaf that did go in a loaf pan). We even gave a few of the small loaves away to other friends and our new neighbors, so it was actually a pretty great thing in reminding myself that I love doing small things for other people. 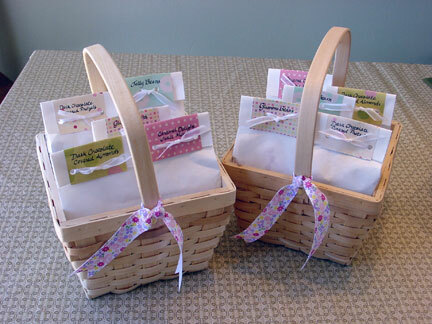 I got some really inexpensive baskets from the craft store and just tied some ribbon around the handles (the baskets were 40% off last week, which is always awesome). Then I filled the baskets with goodies, which proved a bit more difficult than I wanted it to be, but I eventually wrestled everything into them. It was a really great way to do Easter in a grown-up way, and I really enjoyed being creative and thinking outside of the “egg,” so to speak. We enjoyed a wonderful afternoon with our families, and are really looking forward to continuing our tradition in the coming years. 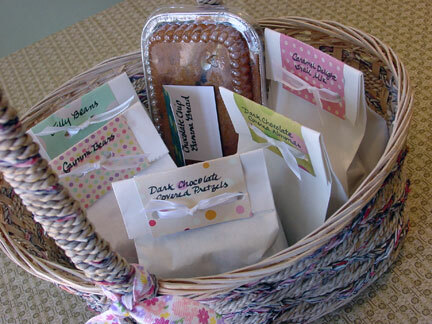 That is such a wonderful idea to give people baskets with bread and little goodies! Your menu sounds fantastic. I love anything cooked in a smoker! I'm so glad you guys had a great first Easter celebration in your new place!